Cats come in all shapes and forms. Even liquid. Documenting them all, an Instagram account called DailyPurrr is creating "stupid cat drawings on [a] daily basis." The portraits they share are purrrfect combinations of simplicity and humor, and even you'll be able to replicate them! 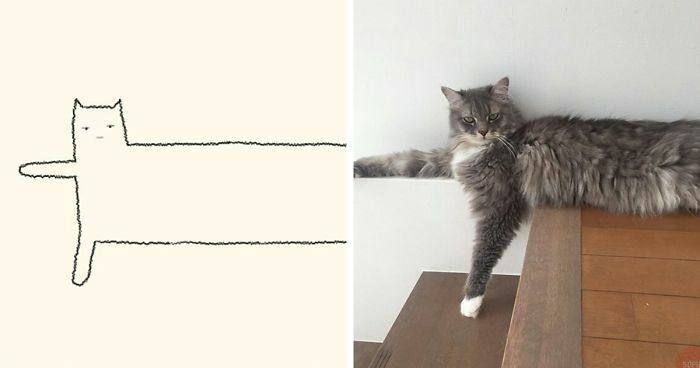 From chilling on the sofa to sliding down the stairs, some of these pieces were inspired by famous internet cats while others were done based on follower submissions. Ainars from Latvia, the man behind DailyPurrr, said that the project started spontaneously. However, it wasn't until he had uploaded 92 images when the collection really went viral. "I just really love simplicity and primitivism in art, and always wanted to draw something simple and share with the people," he told Bored Panda. "I get a lot of submissions," Ainars said. "One time, when I decided to ask people to send me their cat pics in an Instagram story, I got like 150+ messages in one day. When I choose a pic for drawing, I'm looking for awkward poses, stupid cat looks, interesting situations, etc." The artist has two cats himself. His family found Nika and Kuzya on the streets and adopted them right away. Scroll down to check out his drawings and upvote your favorites! "Can you find me legs"
1, 2, 3 and pose. Good job girls, you did great on the cat walk today. Is that a yawn or a yowl? When even your cat sees you've done or said something stupid. This is the exact expression my friend makes at completely random times. You'll be talking to her while doing something, and turn around and she's making this face while doing some incredibly random dance move and singing (horrendously). This isn’t what it looks like. Unless it looks like I’m stuck in an awkward position then it’s exactly what it looks like. I think there might be kittens inside there. Dont ever buy that brand of cat food again! Whadayamean, sit down? This is a rock concert! *David Attenborough voice*. Here we find the origami cat in the folding stages. - or unfolding. My what looong legs you have. Was your daddy a jack rabbit? This cat looks like it's attentively listening to your story. Same kiwi eyes and little tongue. __ You go, little cutie. If you don't have a treat, just go away. Don't worry, I'll chew on it later.